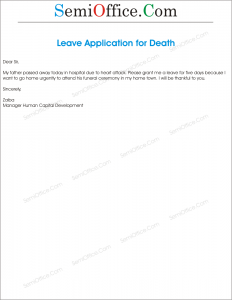 Sample leave application for death of any relations like brother, father, mother, uncle, aunt, family members, wife, son, daughter, nephew etc. to submit in office or to send in email for vocations. My father passed away today in hospital due to heart attack. Please grant me a leave for five days because I want to go home urgently to attend his funeral ceremony in my home town. I will be thankful to you. It is to inform you that my son, Adil Hassan has passed away in a road accident on M2. I am going to Lahore for his funeral ceremony. I’ll join office in a week. My dearest uncle “Ishaaq Ali” passed away yesterday. Today his funeral ceremony at 11:00 AM and I want to attend this. I request you for leave of two days for helping the Uncle’s family in arrangements. Thank you. My younger brother “Mr. Fayaz” lost his life in a road accident and passed away just an hour ago. My family called me urgently to reach home as early as possible for the postmortem, registration of police report and to deal with the other party involved in the accident. I am leaving for home now and informing you. I may remain on leave for two or three days till resolving all the matters. My dearest Mother passed away today morning in a sudden heart attack. She was patient of heart since three years. I request you for leave of four days to go home. I will be thankful to you. 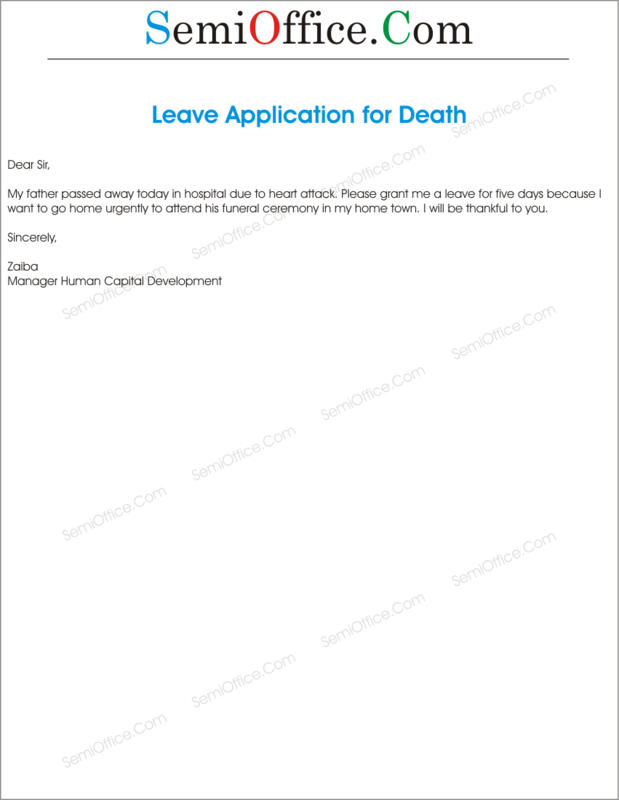 This application is to request a leave of two days. Due to death of my Grandmother I request a leave of two days to participate in her funeral. This time requires that i spend with my family in order to give them moral support in such hours of sorrow. I hope company understands the needs of such a leave and considers my application. I am sorry I couldn’t come to office today. This is because one of my closest friends passed away. He lives in other city so I have to reach there tonight so there was no time for me to inform you about this incident. So I hope you will understand the reason and give me 2 days of leaves. I will be really thankful to you for this. I have to join gathering for Dua for my mother in my home town on 25 November, 2017.